Well, this just overshadows the previous news story of the new XBox 360 controller. I’m a lifelong fan of Tron, and am awaiting the new refresh of Tron. 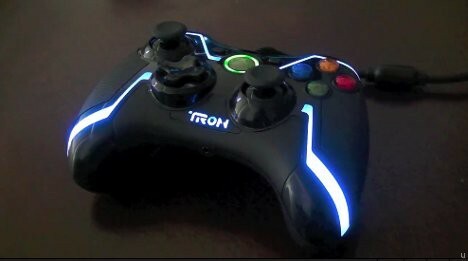 I just found out about the new Tron XBox 360 controller that will be in my hands very soon! This is definitely a must have for any Tron fan. Just amazing. No wireless, but I’m sure you’d be saving some battery life with the LED’s anyway. Not a lot, but still enough to notice. Are you looking forward to the 3D version of Tron? Well, we have news for you – you can definitely soup up your gaming sessions with the Tron Xbox 360 controller for $50. The main drawback we have about this would be the lack of wireless connectivity, but otherwise, you might just prefer to spend your gaming time at nights now with all the lights turned off simply because you want to enjoy the soft glow that makes you think you’re somewhere else instead of your room. The controller itself is pretty responsive, boasting just the right amount of resistance without feeling too loose. As for the triggers, some say that they might feel slightly plasticky, but what do you expect for $50? Perhaps not throwing in wireless is a good thing, since it would require more frequent charging to keep it juiced up for your entertainment.